Chef David Schlosser’s acclaimed kappo-style restaurant in Los Angeles traffics in little known quarters of Japanese cuisine. At Shibumi, simple, minimally manipulated presentations of pristine, seasonal ingredients are essential to beauty, pleasure and well-being. That’s evident in the off-menu emerald-green tempura-battered cannabis fan leaves sprinkled with CBD-infused sea salt. The crunchy leaves and other CBD dishes Schlosser serves must be requested, but they blend in with the kappo concept, one that marries the realm of izakaya (tavern serving small plates to accompany alcoholic drinks) to kaiseki (the formal presentation of a seasonal multicourse meal). Earlier this year kara sumi, salted sun-dried, and smoked mullet roe, shared the menu with sashimi-style Miyazaki beef at $42 for 2 ounces. Fresh bamboo boiled with shiso miso; grilled scallop cured in koji and sake for six months; and house made tofu with salmon roe, shrimp and edamame also appeared on the page. Guests order these dishes a la carte or Schlosser, from his open kitchen behind the bar, determines the omakase, the precise selection and order of a succession of dishes that illuminate the inherent potential of the ingredients. Schlosser became fascinated with the flavors of cannabis a few years ago, serving dishes like an avocado, hemp and wakame salad; chrysanthemum leaves with housemade hemp miso; and greens with hemp seed, hemp oil, hemp leaf and avocado. The current signature CBD dish is pork loin smoked over cannabis branches, grilled and seasoned with CBD salt and organic hempseed oil, served alongside a cabbage and minced cannabis leaf kimchi. Schlosser, who got his start cooking in France in a succession of Michelin-starred restaurants, spent four years cooking in Japan, beginning with a stint as the chef to the U.S. ambassador. Prior to opening Shibumi, he’d dabbled with developing a commercial edible but got too busy after the restaurant opened and the product never got off the ground. Then Ryan Jenneman, CEO and founder of Los Angeles-based cultivator THC Design, came to dinner. Schlosser told Jenneman he was interested in cooking with non-intoxicating cannabis. 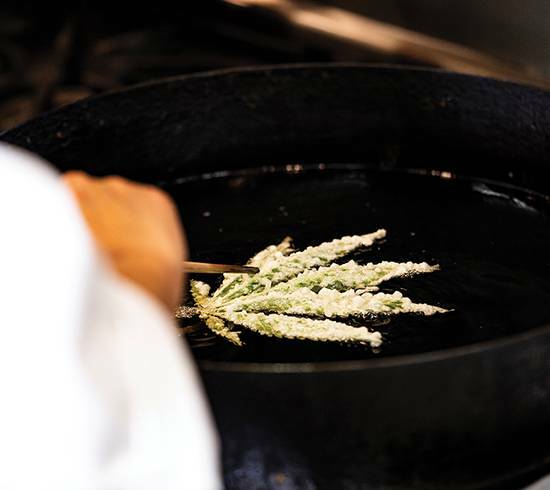 After a tour of the company’s facilities, THC Design began to supply the chef with fan leaves and branches. Meanwhile, hemp oil company Ojai Energetics began contributing CBD concentrates. “I just started messing around,” says Schlosser. All this was happening in the last days before California’s Proposition 61 passed, legalizing recreational marijuana across the state, so Schlosser practiced discretion in an abundance of caution. After the law took effect at the beginning of this year, the media descended, but the chef wasn’t motivated by publicity. It’s also about presenting the food in its purest form.